No this isn't a new avocado dish...find out what it is after the jump! It's Pidan! or a "century egg." It's essentially a fermented egg, and it hails to us from China. 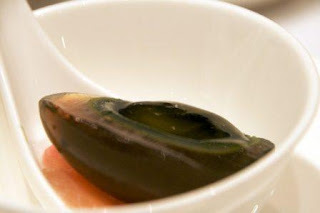 Century egg or pidan (Chinese: 皮蛋; pinyin: pídàn), is a Chinese cuisine ingredient made by preserving duck, chicken or quail eggs in a mixture of clay, ash, salt, lime, and rice hulls for several weeks to several months, depending on the method of processing. Through the process, the yolk becomes a dark green to grey color, with a creamy consistency and an odor of sulphur and ammonia, while the white becomes a dark brown, translucent jelly with little flavor. 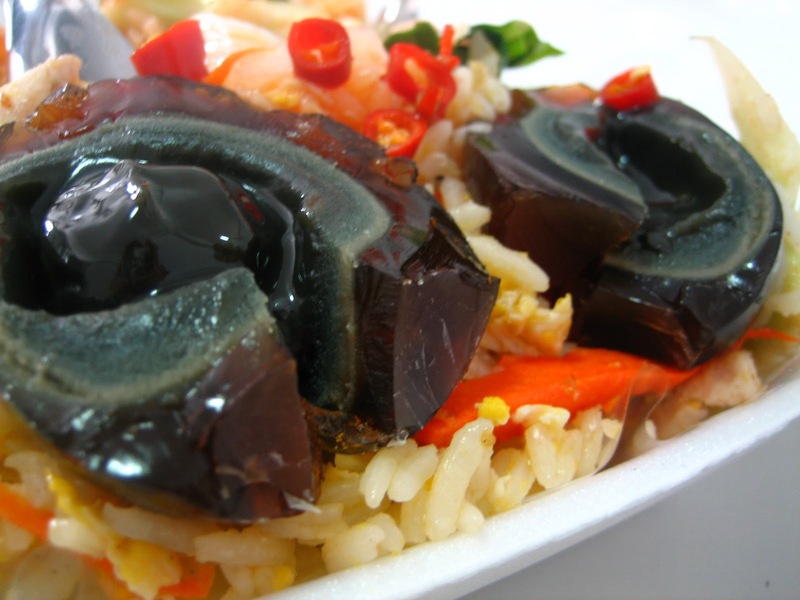 The transforming agent in the century egg is its alkaline material, which gradually raises the pH of the egg to around 9, 12, or more during the curing process. This chemical process breaks down some of the complex, flavorless proteins and fats, which produces a variety of smaller flavorful compounds. Some eggs have patterns near the surface of the egg white that are likened to pine branches, and that gives rise to one of its Chinese names, the pine-patterned egg. ...and then there's the Balut! Yum, yum!